Douglas Rushkoff founded the Narrative Lab at NYU's Interactive Telecommunications Program, and lectures about media, art, society and change at conferences and universities around the world. He lives in Brooklyn with his wife and daughter. By now, you've probably heard people call themselves "slaves" to their phones or their computers. We all know what that means — but why are we allowing ourselves to be slaves to the very instruments of technology we've created? 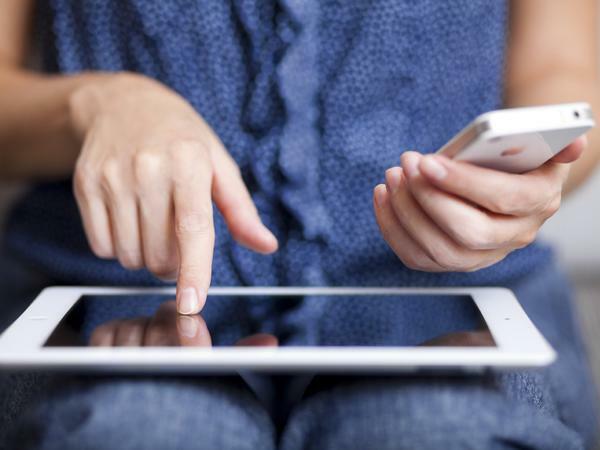 Douglas Rushkoff, who spends his days thinking, writing and teaching about media culture, says it's time for people to stop chasing every ping and start using technology in a way that makes us feel more free. Rushkoff's latest work is called Present Shock: When Everything Happens Now. He joined NPR's Audie Cornish to talk about the book. On the definition of "present shock"
"Most simply, 'present shock' is the human response to living in a world that's always on real time and simultaneous. You know, in some ways it's the impact of living in a digital environment, and in other ways it's just really what happens when you stop leaning so forward to the millennium and you finally arrive there. "In my life, it's sort of the experience of being on Facebook and seeing everyone from my past suddenly back in my present. And the inability to distinguish between who may have been friends of mine in second grade, and people who I've met just yesterday, and people who are actually significant relationships. That collapse of my whole life into one moment, where every ping, every vibration of my phone might just pull me out of whatever it is I'm doing, into something else that seems somehow more pressing on the moment." " 'Digiphrenia' is really the experience of trying to exist in more than one incarnation of yourself at the same time. There's your Twitter profile, there's your Facebook profile, there's your email inbox. And all of these sort of multiple instances of you are operating simultaneously and in parallel. And that's not a really comfortable position for most human beings." "It's interesting — I was at Disney World and I saw this little girl who was looking at one of those signs that said, like, 'Forty minutes until you get on this ride,' and she looked up to her dad, and she said, 'What's a minute?' And I thought that, you know, in the industrial age, and in analog clocks, a minute is some portion of an hour, which is some portion of a day. In the digital age, a minute is just a number. It's just 3:23. It's almost this absolute duration that doesn't have a connection to where the sun is or where our day is. It's this very abstracted way of experiencing time. And what I'm arguing in Present Shock is that that timelessness is very characteristic of living in the digital age, in the age that we're in. And it's very hard for us to orient ourselves, to look forward to things, to join movements with goals, to invest in the future, to think about our long-term careers. We're just kind of in this moment of pause." "It's definitely hard. Your email inbox is a bit like a Las Vegas roulette machine. You know, you just check it and check it, and every once in a while there's some juicy little tidbit of reward, like the three quarters that pop down on a one-armed bandit. And that keeps you coming back for more. But I think what happens is as we get more and more obsessed with those pings, we lose touch with sort of the continuity of life. We forget what it means to really just be there, looking in someone else's eyes rather than down at our phone while we're at a meal. And I guess a lot of what I'm trying to do with this book is to give people permission to take back their time." "In one sense, the most radical thing about my book is that it's a book at all. I'm asking that people say, 'Rather than getting a bullet-point list of things I should do, what value is there in spending six, eight hours with one person in one book?' I'm asking people to kind of take back their time in that way. And what I'm trying to offer is that people can come to understand presentism. They can come to understand the now as a quality of our new culture, rather than the simultaneous onslaught of pings from everywhere else. That we can understand it as kind of the temporal fabric of a new world rather than just an assault." We're going to spend the rest of our Tech segment today talking about how technology has changed our relationship with time. You've probably heard someone say I'm a slave to my computer or my phone. And we all know what that means, but why are we allowing ourselves to be slaves to the very instruments of technology we've created? Digital culture critic Douglas Rushkoff says it's because we're suffering from what he calls present shock. That's the title of his new book. Present shock is a play on a groundbreaking idea coined by futurist Alvin Toffler. In 1970, Toffler defined future shock as too much change in too short a period of time. Well, Rushkoff says no need to look to the future. Everything is happening now. DOUGLAS RUSHKOFF: Most simply, present shock is the human response to living in a world that's, you know, always on real time and simultaneous. You know, in some ways, it's the impact of living in a digital environment. And in the other ways, it's just really what happens when you stop leaning so forward to the millennium and you finally arrive there. CORNISH: So what does that mean in your everyday life? What does that look like? RUSHKOFF: In my life, it's sort of the experience of being on Facebook and seeing everyone from my past suddenly back in my present, you know, and the inability to distinguish between people who may have been friends of mine in second grade and people who I've met just yesterday and people who are actually significant relationships. You know, that sense, that collapse of my whole life into one moment, where every ping, every vibration of my phone might just pull me out of whatever it is I'm doing into something else that seems somehow more pressing on the moment. CORNISH: And does this contribute to another term in your book - I don't know if you came up with this one - digiphrenia? RUSHKOFF: Yeah, digiphrenia is a fun one. I mean, digiphrenia is really the experience of trying to exist in more than one incarnation of yourself at the same time. You know, there's your Twitter profile, there's your Facebook profile, there's your email inbox, and all of these sort of multiple instances of you are operating simultaneously and in parallel. And that's not a really comfortable position for most human beings. CORNISH: Right, because you're trying to maintain them all, right? You want the best foot forward to each one of these different faces. RUSHKOFF: Right. I mean, and computers are really good at multitasking. They do what's called, you know, parallel processing. They have a whole bunch of tasks, and they just divvy them out to the different parts of their chips and their memory and just go about them. You know, human beings can't really do that. So it's really hard to be in one place while you're also in another place. CORNISH: Now, you say that the very way that we think about time has changed in the digital age. And what exactly did you mean by that? RUSHKOFF: You know, in the industrial age and in analog clocks, a minute is some portion of an hour which is some portion of a day. You know, in the digital age, a minute is just a number. It's just 3:23. It's almost this absolute duration that doesn't have a connection to where the sun is or where our day is. It's this very abstracted way of experiencing time. And what I'm arguing in "Present Shock" is that that timelessness is very characteristic of living in the digital age, in the age that we're in. And it's very hard for us to orient ourselves, to look forward to things, to join movements with goals, to invest in the future, to think about our long-term careers, that we're just kind of in this moment of pause. CORNISH: At the same time, isn't this lifestyle addictive, habit-forming? I mean, I don't know if I could not check my phone halfway through dinner. Or, you know, it seems like it's very hard to put this stuff down. RUSHKOFF: Oh, it's definitely hard. I mean, it's - your email inbox is a bit like a Las Vegas roulette machine. You know, you just check it and check it and check it. And every once in a while, there's some juicy little tidbit of reward, like the three quarters that pop down on a one-armed bandit. You know, and then that keeps you coming back for more. But I think what happens is as we get more and more obsessed with those pings, we lose touch with sort of the continuity of life. We forget what it means to really just be there, looking in someone else's eyes, rather than down at our phone while we're at the meal. And I guess a lot of what I'm trying to do with this book is to give people permission to take back their time, you know, and to at least, when they're with other human beings, experience that kind of time as very distinct from the sort of time that they might spend, you know, with their nose buried in a device. CORNISH: But really, I mean, haven't we already gone too far down this path? I mean, it sounds like you're saying something that we've been hearing since the industrial age, which is stop and smell the roses. RUSHKOFF: Well, yes. But it's a different stop and smell the roses, if you will. You know, the industrial age was when everything was about efficiency and time was money. You know, the digital age is actually different where time is no longer about efficiency as much as about sequence. You know, if you think about, you know, the industrial age values were towards progress and goals and winning and end points. You know, the digital age feels much more about kind of steady state problems. It's much more about sustainability. You know, even the kinds of politics we see, you know, are less about a political party winning the day and more about a, you know, a bunch of 20-somethings sitting, occupying a park, not stating any forward-thinking goals at all. 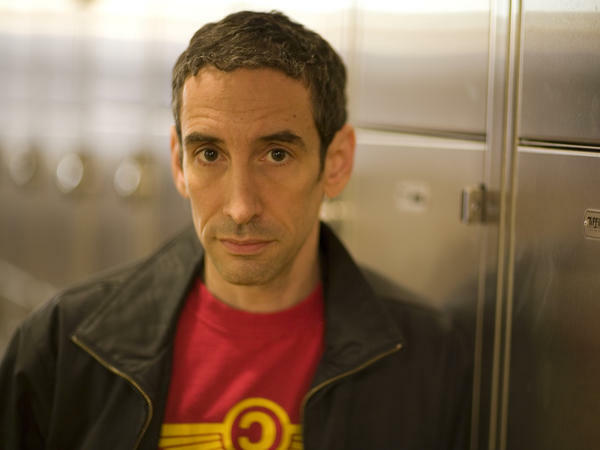 CORNISH: That's Douglas Rushkoff. He's the author of "Present Shock: When Everything Happens Now." Douglas Rushkoff, thank you so much for speaking with us. RUSHKOFF: Oh, thanks so much for having me. Thanks for your time. Transcript provided by NPR, Copyright NPR.